We are so excited to announce our partnership with Beatriz Ball. We will be bringing you pretty tablescapes, decor ideas, watercolor designs, and recipes every couple of months! We thought it would be a great way to inspire pretty table designs and highlight some of our favorite easy recipes. We love decorating and creating so this partnership seemed like a perfect fit. 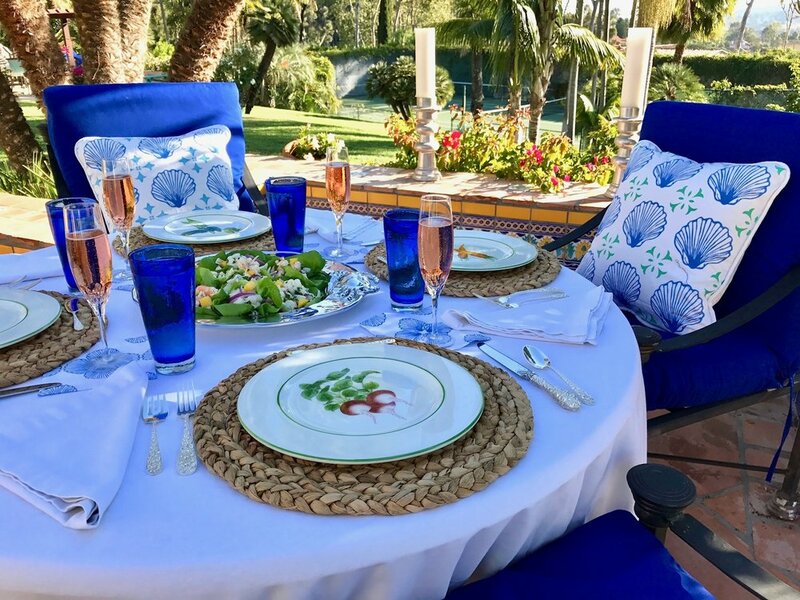 Part of enjoying lunch was creating a relaxing and summery atmosphere to enjoy it in. Decorating a table is just as important as the food you are cooking. The ambiance and how your food is served can celebrate the effort and time it takes to cook. And, it also makes sharing a meal with family and friends more meaningful. Growing up my parents always said "the more the merrier" and we like to linger longer at our table. I am a huge fan of Beatriz Ball. Their designs are kitchen and life friendly which makes hosting friends and family easy. They have a low key elegance that brightens up any table. Most of their pieces don't tarnish or stain (depending on the collection), they are super easy to clean - just mild soap and water, and they can be chilled or warmed up to 350 degrees. We think they look fabulous with our watercolor designs as well which has made this adventure so fun! We decided to go back to our roots for some summer decor ideas. After all, what is more classic than blue, white, crabs, and seashells in San Diego? I spent almost every summer in San Diego until I graduated from college. Right about now I start missing the ocean breeze, cool water, and sand between my toes. 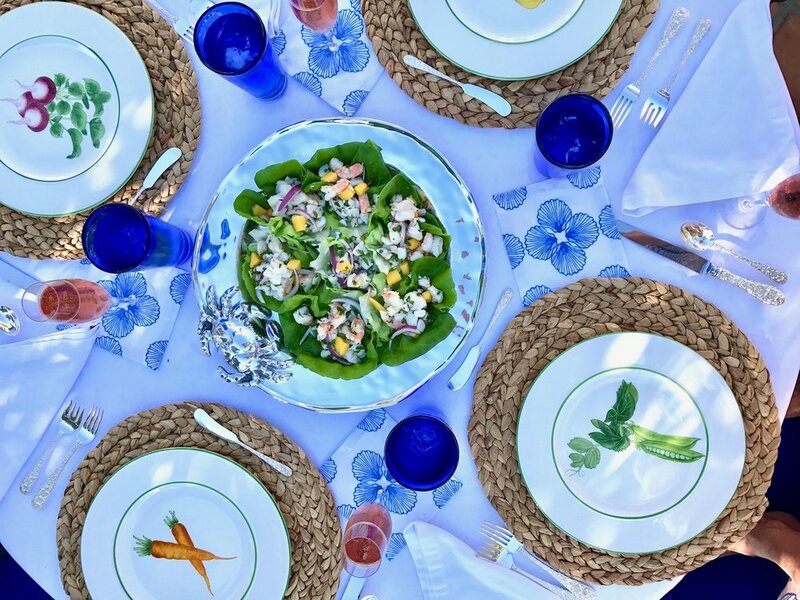 We designed a little summer luncheon that we thoroughly enjoyed this Fathers Day weekend! 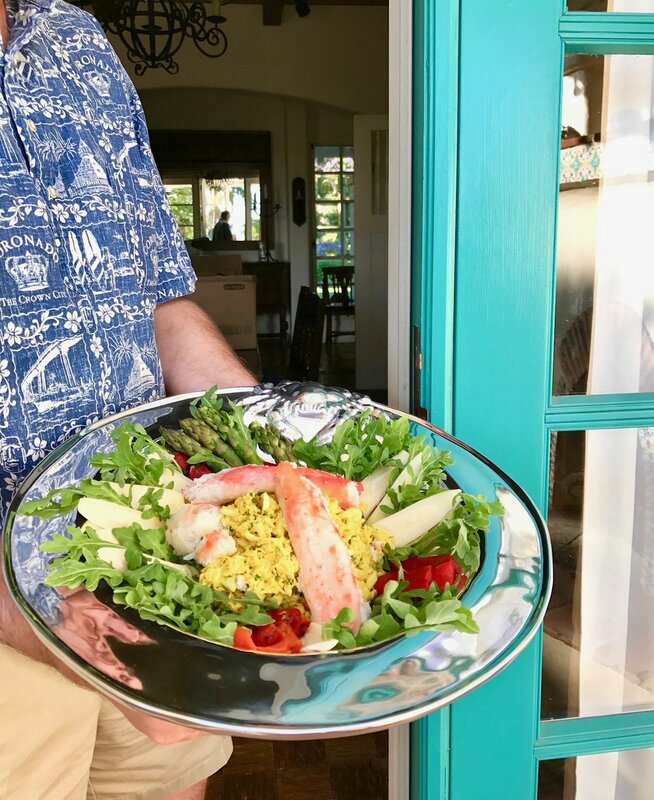 We made some very easy summer fresh chilled ceviche and avocado crab salad (both recipes below). And, of course, we had sparkling rosé to celebrate and a glass of cucumber water made from the garden to top it off. We hope you enjoy our photos and recipes as much as we do! 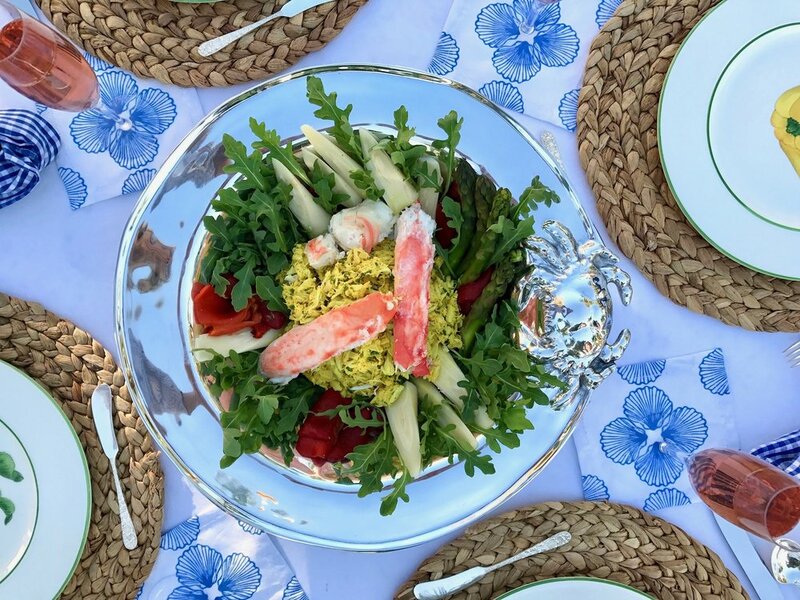 For our summer tablescape we used the Beatriz Ball Crab Plate and Crab Bowl. 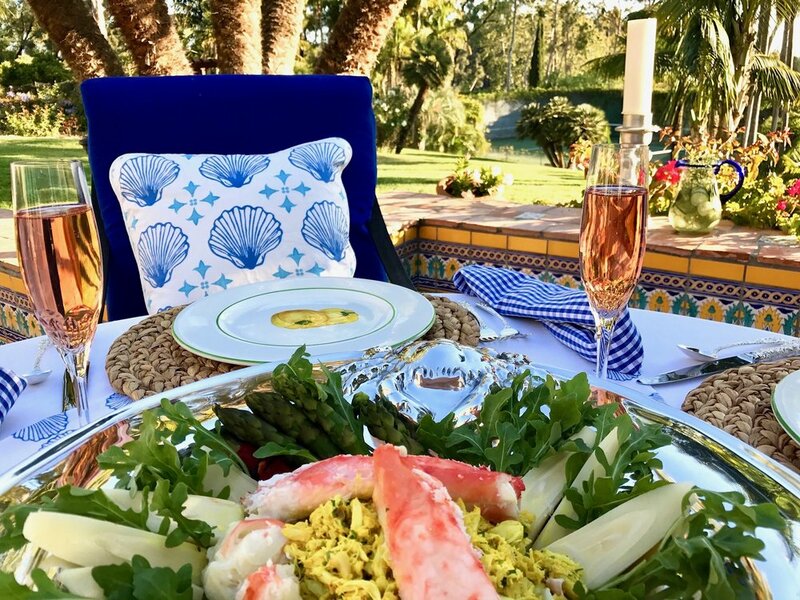 We designed so many scallop patterns (it was soooo hard to pick which to use) and then we made pillows and cocktail napkins. We used blue hand blown Mexican glasses and a matching pitcher. Hyacinth round place mats that match almost anything and add a little texture to our the table. The silver is Kirk Stieff Repousse and we used some of my moms hand painted Italian dinner plates. Taste for seasoning… it’s likely the brandy will have a bite and after overnight chilling it should be gone. 12) 1 # Alaskan king crab legs, cooked and sliced in half. 1) Mix all ingredients, except king crab legs, without breaking-up crab. 4) Layer the crab over the avocados. 5) Garnish the crab with the sliced king crab legs and sprinkle chopped parsley over all. 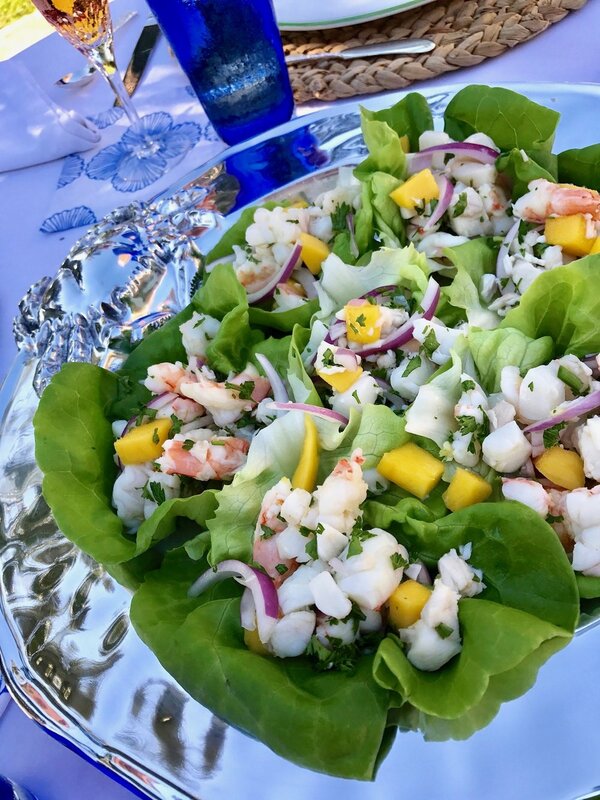 Cover the scallops, shrimp, and halibut with the citrus juices in a plastic bag and refrigerate overnight. The fish is “cooked” once it becomes firm and opaque. Refrigerate for another hour until well chilled. 1 cup coarse chopped cilantro, toss well!